Sturdy steel frame with convenient adjustable daylight and large aluminum work table for ease of mounting tooling. Hardened linear shafts and maintenance free composite die set bearings guide heated head for precise stamping. Four corner die leveling adjustment. Calibrated anti-pinch point die stroke adjustment. Operator friendly touch screen controls with totalizer counter – setup button – head up delay – and before/after transfer index. Ten recipe storage for timer values – air pressure – and temperature settings. Solid state digital dual display proportioning heat control. Two hand anti-tie down buttons with infrared sensing beams are ergonomically designed to eliminate physical pressure. Anti-pinch point and repeat circuits are designed for operator safety. Air filter and pressure regulator. Rugged steel tubing support frame. Versatile frame design shares most components from the one and two ton models. The convenient adjustable daylight and large aluminum work table make setup of tooling effortless. Four corner head leveling adjustment allows easy die alignment to stamping surface. Dies can be easily leveled to a particular part without the use of shims. Top quality components are utilized throughout the manufacturing of Hastings products. Electrical – mechanical and pneumatic components are always standard off-the-shelf components that are readily available. All machined components are painted – zinc plated – or hard anodized for lasting protection. Microprocessor controlled press functions with touchscreen panel allows operator convenience and repeatable stamping. Standard features include head-up strip delay – totalizer cycle counter – and setup feature that allows the head to be jogged down. High accuracy heat transfer index unit utilizes a two speed system and photoelectric eye sensors that can register witness marks or count perforated holes in carrier paper. Front to back fine tuning placement adjustment eases setup of transfers. 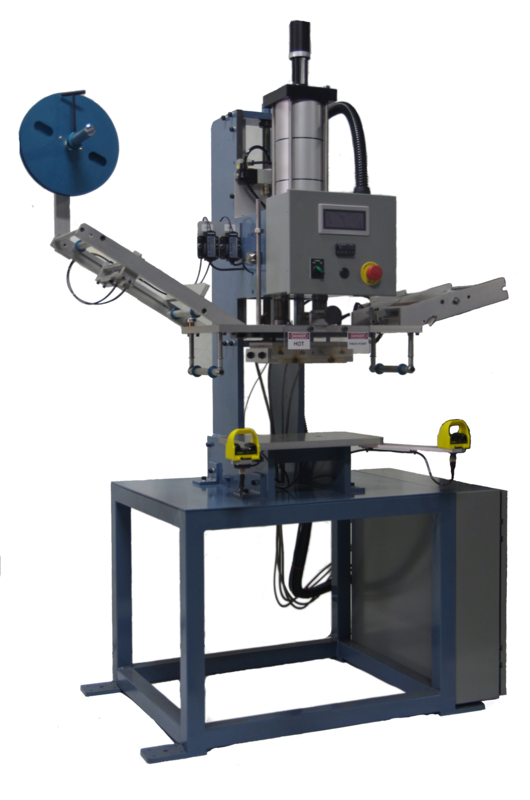 Pneumatic system utilizes high flow components to increase cycle time and efficiency. Pressure regulator and filter control the air flow to the Multi-Power® cylinder. The multi-stage cylinder generates high force from standard shop air without the need for toggle mechanisms and their inherent problems. © 2014 Hastings Mfg. LLC. All Rights Reserved.